Wood bison inhabited Alaska for thousands of years prior to the 1900s. Unregulated hunting and changes in habitat distribution resulted in their extirpation in Alaska, and by 1900 only a few hundred individuals remained in all of North America. In 1970, wood bison in Canada were listed as endangered under the Endangered Species Conservation Act, the predecessor to the Endangered Species Act (ESA). When the ESA was passed in 1973, the wood bison was added to the List of Threatened and Endangered Species. There are no wood bison in the wild in Alaska, nor in the remainder of the United States. Through conservation efforts and management in Canada, the population of 300 wood bison has grown to over 4,000 disease-free animals, with a total of about 10,000 animals in the wild. Canada downlisted wood bison from endangered to threatened status in 1988. In May 2012, the US Fish and Wildlife Service (USFWS) reclassified wood bison from endangered to threatened status under the ESA. See the full report (PDF 320 kB). The “threatened” status of the wood bison under the ESA complicated efforts to re-introduce this species into Alaska. In the past, landowners were unwilling to allow a threatened species on their land due to potential ESA restrictions on resource development. The State cooperated with the USFWS to develop a special rule under Section 10(J) of ESA that designates wood bison in Alaska as a nonessential experimental population. It lists ADF&G as the lead agency managing wood bison, prevents the establishment of critical habitat, allows hunting and other forms of take necessary to manage a wood bison population, and mandates a management plan be developed by diverse interests. In effect, tThe special rule allows the State to manage wood bison on a sustainable basis, like other wildlife species in Alaska, and has allowed the restoration project to move forward. Support from local landowners in the Lower Innoko/Yukon River area has been strong and enthusiastic. 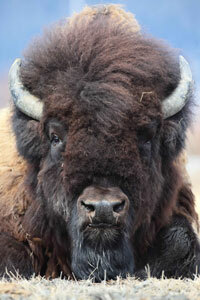 For general information on Wood Bison, see the Wood Bison species profile page.